When the six-year old Presbyterian Church of the Covenant began plans for a “country chapel” and parish house in 1871 it did not have far to look for an architect. Josiah Cleaveland Cady had formed the architectural partnership of Cady, Berg & See the previous year. He was also among a group of church members who had earlier established a mission Sunday school above a stable on East 40th Street. Cady designed a charming Victorian Gothic structure of brown-red brick trimmed in limestone. Quaint gables, diamond-paned windows and a slate tiled roof melded into a picturesque structure in the still-developing neighborhood. The northward growth of the city that instigated the new chapel would, before long, cause the closing of the Church of the Covenant. 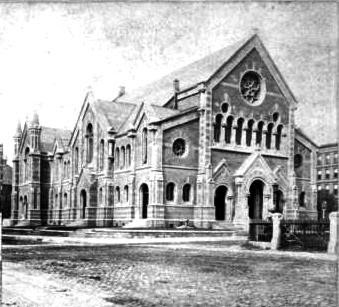 On December 17, 1894 The New York Times reported “Being inadequate to the needs of the congregation, the mother church, on Park Avenue, was torn down some time ago, and its congregation will now worship in the chapel, to which has been transferred the title Church of the Covenant.” Special services were held the evening before commemorating the original church cornerstone and a memorial tablet to William Curtis Noyes which were installed in the former chapel. In the summer of 1897 Sunday school teacher Mrs. Ann Jacques initiated a series of ten-day outings in the country for young boys of the congregation. She took groups of the boys to Nyack, New York, where they could get away from the crowded city and enjoy the fresh air. The problem was that she failed to notify the boys’ parents. The mother of Joseph McCormack rushed to the 67th Street police station in June saying that a “woman in black” had kidnapped her son. After some investigation, Detectives Keating and McDonald discovered the woman in black was Ann Jacques. Sunday services in the Church of the Covenant were normally subdued. But such was not the case on April 3, 1898. On that evening services “were rudely interrupted by a sneak thief,” according to The New York Times. Church member Joseph Miller arrived late and slipped into a rear pew. He casually tossed his overcoat over the back of the pew and turned his attention to the service. Earlier the sexton, Benjamin F. Davis, had noticed two young men enter the church. His suspicions were raised when the men loitered about in the rear, without taking a seat. Davis watched the men distrustfully. His caution was warranted. As the years passed, the neighborhood around the Church of the Covenant gradually changed. Tenements, a power plant and slaughterhouses filled the surrounding blocks. Then in the 1920s real estate developer Fred F. French changed all that. He built his quixotic Tudor City on the three square blocks between East 40th to East 43rd Streets, from First Avenue to Second. The first residential high-rise complex in the world, the buildings reflected old English architectural styles—neo Gothic, Tudor revival, and Jacobethan. Despite their height, the quaint design of the structures created an Old World atmosphere. When the Church of the Covenant (by now affiliated with the Brick Presbyterian Church on Fifth Avenue) laid plans for replacing its outdated parish house, it turned to Tudor City for inspiration. On December 1, 1926 a meeting of congregants was held during which the planned $30,000 parish house was announced. The new parish house was completed the following year. Its Tudor-inspired design with diamond-paned windows, half timbering and creative brickwork was surprisingly harmonious with the Gothic church. In 1933 Adolph Hitler became Chancellor of Germany and his racist pronouncements raised the ire of Rev. Howard V. Yergin of the Church of the Covenant. On April 29, 1934 Yergin denounced Hitler from the pulpit. In what was no doubt a controversial sermon, he also attributed the blame for religious racism to Jews and Christians alike. The following year the Church of the Covenant was the scene of a grisly accident. Herman R. Voigtlander was a 52-year old hosiery manufacturer who lived in a one-room apartment in the Tudor City Woodstock Tower building. Around 10:00 on the night of October 14, 1935 church sexton Max Grandel heard a crash and called police. The responding officers discovered the pajama-clad body of Voigtlander on the roof of the church. Detectives found that his bed had been slept in and surmised that he lost his balance while opening the casement window, falling to his death on the church roof. In 1950 the city graded 42nd Street, lowering it several feet. The change necessitated a granite and limestone base and a flight of steps from the new sidewalk level. The entry doors were repositioned at the time. 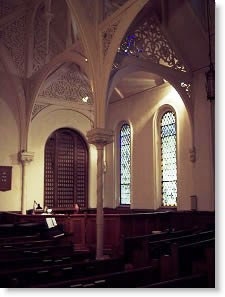 J. Cleaveland Cady’s delightful Church of the Covenant continues as a vigorous presence in the Tudor City neighborhood. What a well researched piece! I did quite a bit of historical research on the building and didn't come up with all of those interesting tidbits. Where on Earth did you find them all?! My 93 year old grandmother remembers attending a summer camp at a church on East 42nd Street in the late 1920s/early 1930s. She told me that she and the other children slept there for two weeks, but due to a disease...they kept the children there for 6 weeks as a safety precaution. I am wondering if this is the church that she remembers... She lived on 45th Street, so it seems natural that this would be the one! Just thought I'd share. A Real West Side Story -- No. 330 W. 47th St.